Submitted by GSite_Editor on Fri, 09/26/2008 - 11:36. Paul Reed Smith Guitars is introducing Al Di Meola’s first signature model PRS guitar during Experience PRS 2008. Officially called the Al Di Meola Prism, the model features a stained top with a full spectrum of colors unlike any finish PRS has ever offered. The Prism prototype was completed just in time for Al to play the new model on stage alongside legendary jazz band mates Chick Corea, Lenny White and Stanley Clark during the Return to Forever world tour this summer. The Al Di Meola Prism features a curly maple custom “9” top with mahogany back, 25” scale length, 22 fret Mexican rosewood fingerboard, custom Al Di Meola neck carve, grommet style locking tuners, standard abalone bird inlays and a tremolo bridge. When discussions about this new signature model began, Al and Paul Reed Smith were both adamant that the guitar maintained the highest quality and tonal integrity. Al also suggested a tie-dye like finish for the guitar, to give it a truly unique look. Paul Smith and the PRS R&D team combined Al’s favorite guitar appointments and a full spectrum of colors to create a one of a kind PRS Guitar. 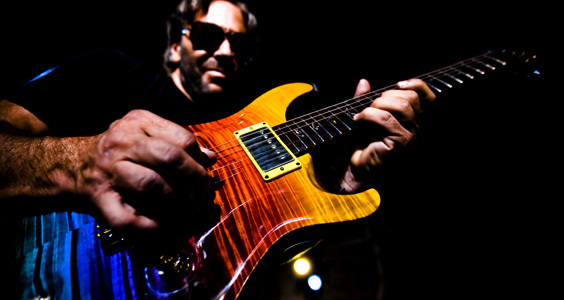 Al Di Meola was one of the very first artists featured on a magazine cover playing a PRS guitar and has supported PRS Guitars for more than 20 years. Not only is the Al Di Meola Prism one of the most striking guitars PRS has ever developed, it pays tribute to a legendary musician who helped lay the frame work for PRS Guitars as a company.